There are limited data regarding the incidence of acute endophthalmitis after sustained-release DEX implant, with only few reported cases.,,, This report describes a case of acute endophthalmitis after DEX implant for CRVO as well as provides the treatment modality. A 54-year-old male presented to our ophthalmology clinic in Al-Khobar, Saudi Arabia, with decreased vision in the right eye. The patient's previous medical history was unremarkable. His best-corrected visual acuity (BCVA) was 20/200 in the right eye and 20/20 in the left eye. The intraocular pressure was 16 mmHg in both eyes, and the anterior segment examination was within normal limits. Posterior segment findings were consistent with CRVO in the right eye. The macular thickness was 550 μm, as measured by the optical coherence tomography. Fundus fluorescein angiography showed nonischemic CRVO associated with diffuse macular edema. Despite multiple intravitreal aflibercept injections in the past, macular edema recurred. Therefore, after obtaining the signed informed consent, intravitreal DEX implant was inserted in the patient's right eye. Moxifloxacin drops were instilled before the insertion. The procedure was performed in a minor operating room taking all sterile precautions, including the surgeon and all other health personnel wearing surgical caps and masks and using a single-use sterile applicator. The patient's nose and mouth were covered with a surgical cloth, and a sterile lid speculum and calipers were used. A sterile ophthalmic solution of benoxinate hydrochloride (0.4%) was instilled in the right eye. Eyelids were scrubbed using 10% povidone–iodine solution, followed by application of 5% povidone–iodine solution to the ocular surface. Subsequently, the patient was discharged with moxifloxacin eye drops two times a day for 5 days. Three days after the procedure, the patient presented to our ophthalmology clinic with pain, redness and blurred vision in the operated eye. His visual acuity decreased to counting fingers at 1 m. Anterior segment examination revealed 4+ anterior chamber cells, fibrinous reaction, hypopyon, moderate corneal edema and vitritis [Figure 1]. Ophthalmoscopy of the right fundus showed a vitreous haziness with no clear visualization of the retina. B-scan ultrasonography showed increased intravitreal echoes due to an inflammatory reaction. Accordingly, a diagnosis of acute endophthalmitis was made. The patient was then admitted to the hospital and aqueous and vitreous specimens for microbiological culture and analysis were subsequently obtained. Concurrently, a combination of ceftazidime 2.25 mg/0.1 ml and vancomycin 1.0 mg/0.1 ml was injected into the vitreous. Topical fortified ceftazidime 50 mg/ml and vancomycin 25 mg/ml eye drops were instilled every hour; topical prednisolone acetate 1% and cyclopentolate 1% were instilled three times a day. Oral moxifloxacin (400 mg) was also prescribed once a day. After 1 week, the signs and symptoms of endophthalmitis resolved (i.e., there was no pain and hypopyon) [Figure 2]. The patient was discharged with a tapering regimen of topical steroid and antibiotic drops. The culture results from both aqueous and vitreous fluids were negative for any infection. One month later, the patient underwent vitrectomy for residual vitreous haze. The BCVA in the last follow-up was 20/200 for the right eye. DEX implant is a type of intravitreal injection designed to provide sustained delivery of dexamethasone to the retina. It has received the US Food and Drug Administration approval for the management of macular edema secondary to BRVO and CRVO. The most commonly reported side effects of intravitreal insertion of DEX implant are cataract progression, increased intraocular pressure and subconjunctival hemorrhage., Few authors have reported unusual complications, including migration of the implant to the anterior chamber in aphakic and pseudophakic eyes with defective posterior lens capsule. In these instances, the implant in the anterior chamber may cause corneal endothelial damage and would require removal. Fragmentation of the implant in the vitreous cavity after the insertion is believed to be commonly encountered and is considered harmless as well as it does not alter the efficacy level. Endophthalmitis is considered the most concerning complication associated with intraocular procedures. The rate of endophthalmitis after intravitreal injections ranges between 0.019% and 1.4%. However, its occurrence in the eye with intravitreal DEX implant is rare.,, Boyer et al. and Zarranz-Ventura et al. reported one case each among 142 and 347 patients, respectively. However, detailed information on the management of these patients was limited. Marchino et al. and Arıkan Yorgun et al. also reported cases of endophthalmitis after DEX implant that were managed using pars plana vitrectomy and removal of the implant followed by intravitreal antibiotic injections., Our patient had favorable outcome with intravitreal antibiotic injections alone. This is consistent with the outcome in two cases of endophthalmitis following DEX implants. Admittedly, our patient had better visual acuity at initial presentation compared with that of the patient treated by Marchino et al., whose BCVA was only light perception. This reflects that the severity of the infection, and consequently its prognosis, are directly influenced by the level of initial visual acuity and the general condition of patients' eyes. Intraocular contamination occurs mainly from pathogens of the lid margin and conjunctiva, with consequent inoculation into the vitreous cavity. Evidence-based management has shown that a single application of povidone–iodine has a bactericidal effect comparable with topical antibiotics given for 3 days. Recently, aerosolized droplet contamination from the oropharyngeal tract has been found to increase the incidence of streptococcal endophthalmitis. To minimize such contamination, strict precautionary measures are recommended such as avoiding talking and wearing surgical masks during the procedure. Another possible risk factor for vitreous contamination is the relatively large scleral port for the 22-gauge needle on the injecting applicator, which requires a self-sealing scleral oblique/biplanar approach. 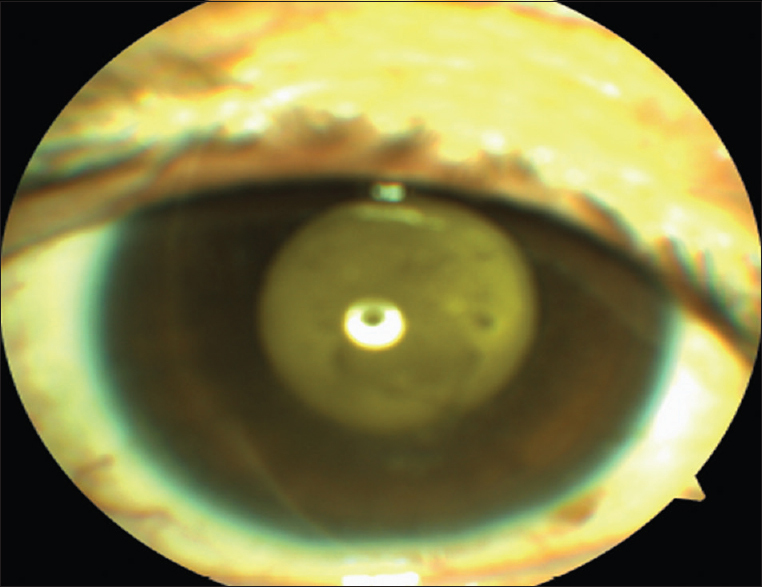 Despite the best efforts of the authors to prevent contamination by maintaining aseptic conditions before inserting the implant, the patient yet developed endophthalmitis 3 days after DEX implantation. This is similar to previously reported cases of acute endophthalmitis following DEX implants.,,,, Endophthalmitis following an intravitreal insertion of DEX implant has no established treatment guideline, in contrast to acute endophthalmitis after cataract extraction that has a detailed treatment algorithm constructed by the Endophthalmitis Vitrectomy Study. In the current report, the authors did not opt for surgical intervention, and rather chose to closely monitor the patient's condition after treatment with intravitreal antibiotics. This approach was successful in treating our patient. This report has certain limitations, including the negative culture and the unsystematic treatment strategy followed. The culture-negative cases of endophthalmitis can be attributed to either a small bacterial load that is difficult to isolate in culture or to a noninfectious inflammation. Nevertheless, an empirical treatment strategy with antibiotics is yet a viable option. 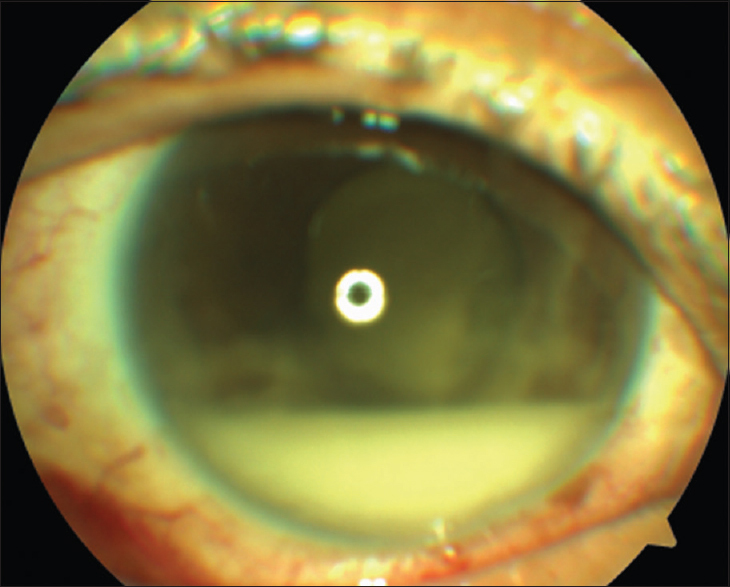 This report shows that patients can develop endophthalmitis after intravitreal DEX implant. Immediate use of intravitreal antibiotics can be a suitable treatment alternative in less severe cases. Future wide-scale interventional trials are indispensable to determine a specific management protocol for managing endophthalmitis following sustained-release DEX implant. The authors certify that they have obtained all appropriate patient consent forms. In the form, the patient has given his consent for his images and other clinical information to be reported in the Journal. The patient understands that his name and initials will not be published, and due efforts will be made to conceal his identity, but anonymity cannot be guaranteed. Kodama M, Numaga J, Yoshida A, Kaburaki T, Oshika T, Fujino Y, et al. Effects of a new dexamethasone-delivery system (Surodex) on experimental intraocular inflammation models. Graefes Arch Clin Exp Ophthalmol 2003;241:927-33. Sivaprasad S, McCluskey P, Lightman S. Intravitreal steroids in the management of macular oedema. Acta Ophthalmol Scand 2006;84:722-33. Haller JA, Bandello F, Belfort R Jr., Blumenkranz MS, Gillies M, Heier J, et al. Dexamethasone intravitreal implant in patients with macular edema related to branch or central retinal vein occlusion twelve-month study results. Ophthalmology 2011;118:2453-60. Schmitz K, Maier M, Clemens CR, Höhn F, Wachtlin J, Lehmann F, et al. Reliability and safety of intravitreal ozurdex injections. The ZERO study. Ophthalmologe 2014;111:44-52. Marchino T, Vela JI, Bassaganyas F, Sánchez S, Buil JA. Acute-onset endophthalmitis caused by alloiococcus otitidis following a dexamethasone intravitreal implant. Case Rep Ophthalmol 2013;4:37-41. Boyer DS, Yoon YH, Belfort R Jr., Bandello F, Maturi RK, Augustin AJ, et al. Three-year, randomized, sham-controlled trial of dexamethasone intravitreal implant in patients with diabetic macular edema. Ophthalmology 2014;121:1904-14. Zarranz-Ventura J, Carreño E, Johnston RL, Mohammed Q, Ross AH, Barker C, et al. Multicenter study of intravitreal dexamethasone implant in noninfectious uveitis: Indications, outcomes, and reinjection frequency. Am J Ophthalmol 2014;158:1136-45. Arıkan Yorgun M, Mutlu M, Toklu Y, Cakmak HB, Caǧıl N. Suspected bacterial endophthalmitis following sustained-release dexamethasone intravitreal implant: A case report. Korean J Ophthalmol 2014;28:275-7. London NJ, Chiang A, Haller JA. The dexamethasone drug delivery system: Indications and evidence. Adv Ther 2011;28:351-66. Khurana RN, Appa SN, McCannel CA, Elman MJ, Wittenberg SE, Parks DJ, et al. Dexamethasone implant anterior chamber migration: Risk factors, complications, and management strategies. Ophthalmology 2014;121:67-71. Bourgault S, Albiani D. Re: Split ozurdex implant: A caution. Can J Ophthalmol 2013;48:218-9. Cheung CS, Wong AW, Lui A, Kertes PJ, Devenyi RG, Lam WC, et al. Incidence of endophthalmitis and use of antibiotic prophylaxis after intravitreal injections. Ophthalmology 2012;119:1609-14. Guigou S, Pommier S, Meyer F, Hajjar C, Merite PY, Parrat E, et al. Efficacy and safety of intravitreal dexamethasone implant in patients with diabetic macular edema. Ophthalmologica 2015;233:169-75. Esen E, Sizmaz S, Demircan N. Two cases of acute endophthalmitis after intravitreal dexamethasone implant injection. Retin Cases Brief Rep 2016;10:154-6.
de Caro JJ, Ta CN, Ho HK, Cabael L, Hu N, Sanislo SR, et al. Bacterial contamination of ocular surface and needles in patients undergoing intravitreal injections. Retina 2008;28:877-83. Speaker MG, Milch FA, Shah MK, Eisner W, Kreiswirth BN. Role of external bacterial flora in the pathogenesis of acute postoperative endophthalmitis. Ophthalmology 1991;98:639-49.